Bauer Media is closing car magazine Top Gear Australia and its website, with the magazine to shutter after its October edition. David Goodchild, Bauer Media CEO, said in a statement: “Top Gear Australia magazine had entertained and delighted many hundreds of thousands of readers over the years with its irreverent take on the motoring genre, however TopGear’s skew towards international content meant it no longer fitted Bauer Media’s evolving motoring strategy. The closure of the title follows on from Bauer Media selling three of its motorcycle titles to boutique publisher Citrus Media earlier this month. A Bauer Media spokesperson said the decision affects two editorial roles, but options were being investigated for possible redeployment. It comes as the BBC, which published Top Gear Australia as part of a joint venture with Bauer Media, focuses its efforts on the recently relaunched global TopGear website. The Top Gear TV show has made headlines globally in the last six months after presenter Jeremy Clarkson was dumped after hitting a producer. He subsequently signed a $60m-per-year deal with Amazon Prime, taking co-hosts James May and Richard Hammond with him for a new motoring show. Top Gear will now be presented by UK personality Chris Evans. In a statement Alistair McEwen, SVP, commercial development for BBC Advertising Asia, Australia and New Zealand thanked the team for their work on the product. Top Gear Australia associate publisher Ewen Page thanked the magazine’s editorial team. According to the Audit Bureau of Circulation figures ended December 2014, TopGear Australia had a circulation of 40,305 copies a month. Bauer Media continues to have a number of specialist motoring titles in its portfolio, including Wheels, Motor, Street Machine, Unique Cars, 4×4 Australia and Auto Australia. 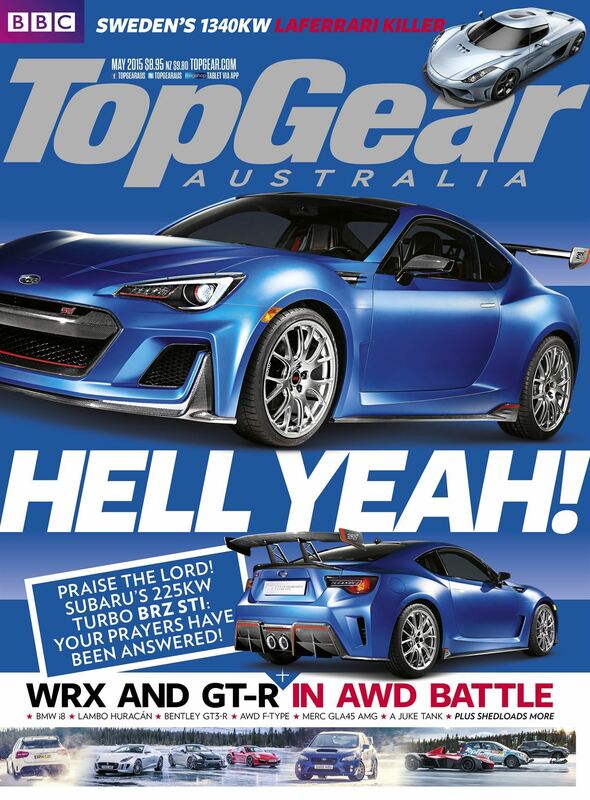 “So, while we bid farewell to Top Gear Australia magazine, we remain committed to delivering Australia’s most comprehensive motoring coverage, and in fact have recently launched a specialist new car comparison website, WhichCar, a brand that represents a significant investment and a huge vote of faith in the future of our motoring group,” said Bauer’s Goodchild. There was a time when Australian magazine companies published Australian magazines for local readers. Far too many magazines now are just limp versions of some overseas publication. Funny that the picture Mumbrella uses is an issue with an obvious bait article on the cover. Promising a report of a turbo BRZ STI. The picture they used is of a Subaru concept shown at the New York auto show. The car did NOT have a turbo engine, instead running a naturally aspirated racing spec engine. The car was also never intended for production. But don’t let the facts get in the way of journalism. Rumours and clickbait journalism is ruining auto news.